I was ecstatic Saturday when I stumbled upon a lazy Susan at a garage sale. I know it's nothing spectacular or special, but I have recently stumbled upon a wonderful idea using this old piece of hardware. 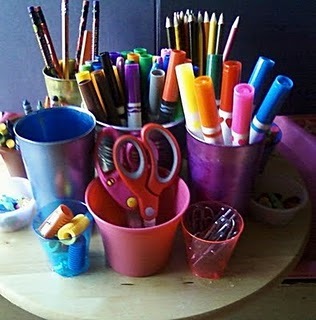 The blog, Michelle's Charm World featured an idea for creating ideal craft spaces. I don't know if this old gal will turn out as nice, but I am up for an extreme makeover! No more cans of peaches or stale spices for this Susan. Michelle's Charm World is one of my favorite blogs I follow. She has a plethora of ideas for the family and educational opportunities to include in your daily routines. I love her crafts and dedication. I browsed her blog and thought I would highlight a few of her recent posts that I have enjoyed. Drop by and say hello. Tell her Plain Graces sent you! AND THERE'S PLENTY MORE! Especially, if you like fun ideas and educational resources on a budget. Stay tuned, I will highlight a few of my favorite blogs in the next few weeks. What are your favorite blogs to follow?